Count Giants owner John Mara among those who never thought the team would trade Odell Beckham Jr. Speaking today from the owner’s meetings, Mara said “he never thought they’d trade Odell right up until the final day,” according to Ralph Vacchiano of SNY (Twitter link). Mara also said he finally gave his “reluctant approval” for the deal, Vacchiano wrote in a separate tweet. In additional comments made to reporters, Mara and co-owner Steve Tisch emphasized over and over how difficult of a decision it was to ship Beckham to the Browns. Mara also said whether or not the trade proves to be a success will be determined by the front office making “the right decisions” with the draft picks the Giants got from Cleveland. The Redskins traded for Case Keenum, but so far they’ve insisted that Keenum will have to compete for Washington’s quarterback job with Colt McCoy, and potentially with a rookie. Alex Smith is all but certain to miss the entire 2019 season. McCoy is, like Smith, recovering from a leg injury. McCoy recently underwent a second surgery on his leg, but is expected to be ready for the Redskins’ offseason program, according to Tarik El-Bashir of The Athletic (Twitter link). It remains to be seen if McCoy will actually seriously push Keenum for the job, but he’ll at least be healthy enough to put up a fight. The Broncos let center Matt Paradis walk in free agency, and they apparently attempted to make a big splash to replace him. Denver tried to sign center Mitch Morse before he signed with Buffalo, according to Mike Klis of Denver 9News. The Bills made Morse the highest-paid center in the league, which priced him out of the Broncos’ range, Klis writes. The Broncos now have major questions on the interior of their offensive line, and Klis expects them to make a move to address them soon. There’s been a lot of talk about a potential work stoppage the next time the CBA expires, with players expected to make major demands that the owners might not be willing to meet. In the run up to those negotiations, there are apparently major tensions between the NFLPA and NFL agents, according to Mike Florio of ProFootballTalk.com. A group of players and agents had a meeting last week, and multiple sources told Florio “it did not go well.” In a separate post, Florio posted the full memo he obtained about what happened in the meeting. Florio writes that the discord between the two camps “will be music to the ears” of the owners, who would like to see their opponents as divided as possible. The Antonio Brown era with the Bills didn’t last long. Shortly after it was reported that Brown was headed to Buffalo, the report turned out not to be true. It was acknowledged by all parties that there were talks between the Steelers and Bills but we didn’t know many details of what exactly happened, until now. Vic Carucci of The Buffalo News came out with a story that delved into what happened, and talks apparently broke down because of Brown’s contract. Bills brass was going back and forth with Brown’s agent Drew Rosenhaus, and “discussed a potential renegotiation of the receiver’s contract,” according to Carucci. Carucci noted that the more new money the Bills gave Brown, the less compensation they were willing to give the Steelers in a trade and vice versa. Carucci shot down reports that Brown was mortally opposed to playing in Buffalo, writing that the Bills were confident that “if they met his financial demand and were able to make the trade, Brown would have happily joined them.” In the end, renegotiating Brown’s contract proved too difficult and is what ultimately led to the breakdown in talks. Speaking of Brown, the Bills weren’t the only team to withdraw over Brown’s contract. Another team pursuing Brown walked away because “it was communicated to them” that Brown wanted a new contract that would make him the highest-paid receiver in the NFL with any new team, according to Albert Breer of SI.com. It was previously thought that the Steelers’ demands for a first round pick might’ve been delaying this process, but it sounds like Brown’s contract is the biggest hurdle at the moment. While Brown still hasn’t been traded, Case Keenum has. Keenum was dealt to the Redskins yesterday in a surprising trade, and fans weren’t the only ones caught off guard by the move. Keenum apparently didn’t know it was coming either, and neither he nor his camp were involved in finding Washington as a landing spot, according to Ryan O’Halloran of The Denver Post (Twitter link). Alex Smith is very likely to miss at least the entire 2019 season, and as of right now Keenum is likely to be the team’s starting quarterback next season. 49ers punter Bradley Pinion “has been telling those around him that he does not expect to be back” next year, Matt Barrows of The Athletic hears. Barrows points out that Pinion ranked 24th in net average and had 22 punts inside of the 20-yard line, putting him somewhere in the middle of the pack. He also handled kickoffs, so the Niners will have to find someone new to cover both roles assuming they move on. Pinion was a fifth round pick of San Francisco back in 2015, and is about to enter unrestricted free agency. Broncos offensive tackle Billy Turner had been discussing an extension with the team, but those talks have “broken off”, according to Ian Rapoport of NFL Network (Twitter link). Rapoport writes that Turner will now hit the open market, and that the Broncos will now be a “prime” candidate to sign a right tackle in free agency. Turner started 11 games for the Broncos last season, earning average marks from Pro Football Focus. Case Keenum is be D.C.-bound. On Thursday, the Redskins and Broncos hammered out a trade to send the quarterback to Washington, as Ian Rapoport of NFL.com tweets. 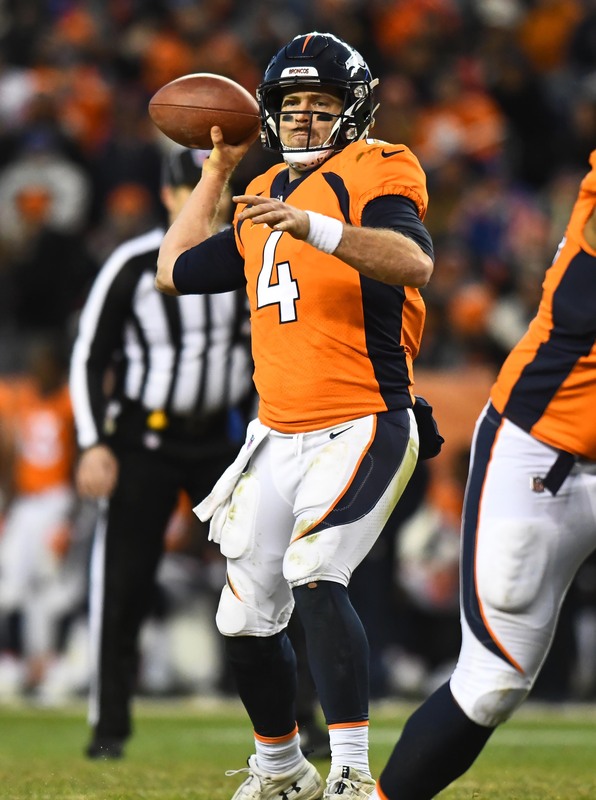 The trade will send Keenum and a Broncos 2020 seventh-round pick to D.C. in exchange for a 2020 sixth-round pick, according to Mike Klis of 9News (on Twitter). Meanwhile, Keenum has agreed to rework his contract in order to facilitate the deal. Keenum had the opportunity to earn $21MM in ’19 under the terms of his old contract, but the revised pact will give him $7.5MM in total. The Broncos will pay Keenum a $500K restructure bonus and contribute $3.5MM towards Keenum’s $7MM salary. Meanwhile, Washington will pay their $3.5MM half of the tab. Ultimately, the Broncos saved themselves a few million and the Redskins found an inexpensive veteran to compete with Colt McCoy for the starting gig. Keenum, 31, joined the Broncos on a two-year, $36MM deal prior to the 2018 campaign. Unfortunately, his season with Denver did not go as planned as the Broncos slumped to a 6-10 mark. This offseason, he was squeezed out of his starting job when the Broncos acquired Joe Flacco from the Ravens. With the Redskins, Keenum may have an opportunity to take over for Alex Smith, who is fighting his way back from a gruesome leg injury. He’s not long removed from leading the Vikings to the NFC Championship Game during a 2017 season in which he ranked second in Total QBR, seventh in adjusted net yards per attempt (the passing metric most correlated with winning), fifth in interception percentage, and seventh in sack percentage. On the flipside, Keenum’s 2018 marks tell a different story. Among 33 qualifying quarterbacks, Keenum finished 30th in Total QBR, 28th in ANY/A, 21st in interception percentage, and 11th in sack percentage. A year after ranking first in Football Outsiders‘ DVOA (meaning he was extremely effective on a per-play basis), Keenum fell all the way to 29th in 2018. With the No. 15 pick in the draft, the Redskins are unlikely to land either Kyler Murray or Dwayne Haskins, so a short-term solution such as Keenum might make the most sense for them. There’s also the free agent market to consider, but Smith’s $20.4MM cap hit could be prohibitive in the pursuit of someone like Nick Foles. No surprise here, but the Broncos are now set to shop quarterback Case Keenum, according to Ian Rapoport of NFL.com (on Twitter). Keenum, of course, was displaced from the starting role after the Broncos agreed to acquire Joe Flacco from the Ravens on Wednesday morning. Keenum is guaranteed $7MM in 2019, so the Broncos see only two options for him if they cannot find a trade: Keenum will either have to accept a massive pay cut to serve as Flacco’s backup, or he’ll be released outright. 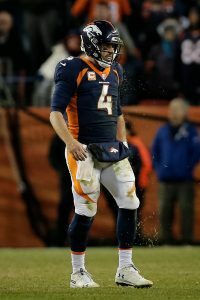 Keenum flopped in his lone season as the Broncos’ starter, finishing 31st in Total QBR, 29th in DYAR, and 28th in quarterback DVOA. It was a sharp contract from the 2017 season in which he led the NFL in DVOA as the top signal caller for the Vikings. In that ’17 season, Keenum ranked seventh in passer rating and ninth in adjusted net yards per completion. The QB no longer profiles as an above-average starting option, but he would be highly coveted as a backup by many NFL teams. One of the NFL’s top centers over the past four years, Matt Paradis is a month away from free agency. The four-season Broncos starter continues to rehab a broken fibula sustained in November, and Ian Rapoport of NFL.com tweets Paradis is ahead of schedule. Prior to going down midway through this season, Paradis had not missed a snap since debuting in the Denver starting lineup at the 2015 season’s outset. He is probably the Broncos’ top in-house priority, with the Bradley Roby–Shaquil Barrett–Shane Ray defensive troika likely set to depart. But Paradis is believed to want to test the market rather than re-signing to stay in Denver before hearing other teams’ pitches. If the 29-year-old snapper does hit free agency, there is a reasonable chance he will become the NFL’s highest-paid center. Ryan Jensen, a free agent last year who struggled in 2018, holds that distinction presently with a $10.5MM-per-year deal. Case Keenum‘s first Broncos season did not do much to dispatch the notion his Vikings emergence was a fluke. He finished 31st in Total QBR, 29th in DYAR and 28th in quarterback DVOA. Keenum led the NFL in DVOA in 2017. But the $10MM dead-money hit the Broncos would take if they jettisoned their 2018 starter, coupled with the team’s hope Keenum can improve under new OC Rich Scangarello, points to the 30-year-old passer having a decent chance at sticking around for 2019, Nicki Jhabvala of The Athletic notes (subscription required). Keenum is on the Broncos’ books at $21MM for next season. John Elway going after another veteran, thus further delaying a long-term plan the Broncos whiffed on with Paxton Lynch, would not be out of character given the GM’s stance on rebuilding. If the Eagles do not follow through on franchise-tagging Nick Foles, whom the Broncos bypassed in the 2012 second round to select Brock Osweiler, Jhabvala can envision Elway considering the Super Bowl LII MVP to replace Keenum. The Broncos would obviously run the risk of gambling on one system-dependent quarterback to potentially doing the same thing a year later, but if they do not have to surrender a third-round pick to the Eagles, it would make more sense than giving up assets and Keenum dead money for Foles. The Jaguars’ situation and John DeFilippo hire make them a more logical Foles destination, but the Broncos hold far more cap space. Denver passed on double-dipping in quarterback investments last year. After signing Keenum, they selected Bradley Chubb over Josh Allen and Josh Rosen. But Jeff Legwold of ESPN.com’s bold prediction is the Broncos both signing a UFA passer and using a high pick to bring in a rookie. This scenario would lead to an astounding number of Broncos quarterback solutions conjured up post-Peyton Manning. The Broncos added a pair of entry-level coaches recently, appointing Justin Rascati and Mike Hiestand to their staff as offensive and defensive quality control coaches, respectively, Jhabvala tweets. There’s been several high profile names rumored to be trade candidates over the past week, including Raiders receiver Amari Cooper. It was reported earlier today that the Raiders were shopping the former first round pick, but now coach Jon Gruden is pushing back on those reports. “I’m not. I’m not. I’m just sorry to have to deal with a lot of these reports” Gruden insisted when asked about the reports saying he wanted to get rid of Cooper, according to Scott Bair of NBC Sports (Twitter link). Cooper was injured in the Raiders’ loss to the Seahawks after taking a nasty hit and was diagnosed with a concussion. He’s in the last year of his rookie deal but has a fifth-year option for next year, meaning any team that traded for him would have control of him in 2019. Gruden also previously insisted he wasn’t trying to trade Khalil Mack, so perhaps his denials should be taken with a grain of salt. Case Keenum had another rough game, prompting reporters to ask coach Vance Joseph after the game if Keenum would remain the starter for the Broncos. Joseph answered affirmatively, saying “Case is our quarterback”, according to Nicki Jhabvala of The Athletic (Twitter link). Keenum left for one play to be evaluated for a concussion, and the home crowd gave backup Chad Kelly a standing ovation. With the Broncos a sinking ship and Joseph on the hot seat, it wouldn’t be surprising if Kelly gets a look at some point. Speaking of Oakland, the Raiders have benched their 2017 first round pick, cornerback Gareon Conley, playing him on zero defensive snaps in their Week 6 loss. Conley could be a possible trade target, according to Mike Garafolo of NFL Network, who tweets that “teams looking to buy low on Conley will be calling.” Gruden has shown a willingness to get rid of high-profile players, and it wouldn’t be surprising if the team gives up on Conley despite his limited time on the field. He missed most of his rookie season due to injury. Chiefs All-Pro safety Eric Berry has mysteriously missed every game this season without much of an update from the team, and he is still without a timetable for a return, according to Jason La Canfora of CBS Sports. Sources told La Canfora that the team is “extremely confident that he will play this season”, but no one seems to know when and the team will continue to “exude extreme caution” handling him. The Chiefs defense has been a liability this season, and would get a massive boost from Berry’s return.